On 19 December 2016, human rights defender Ms Nelly Mbangu received the latest in a series of death threats via phone call and text message from an unknown number/sender. Nelly Mbangu is a human rights defender working on women’s rights and children’s rights in North Kivu. She is the coordinator of Help and Action for Peace - Aide et Action pour la Paix (AAP), and is a leader amongst women human rights defenders in her community in North Kivu. In addition to their work for women’s and children’s rights, Help and Action for Peace work on good governance, conflict resolution of land rights disputes, and environmental and natural resources protection in the region. As issues of land rights and environmental protection often disproportionately impact women, Help and Action for Peace links these diverse issues together to positively impact the human rights situation in North Kivu. 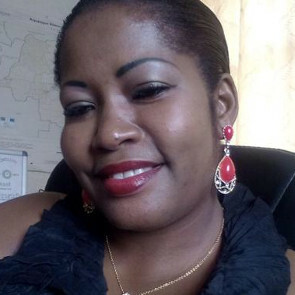 On 17 December 2016, Nelly Mbangu received the first text message from an unknown number stating, “I am a killer, you have to know that I was paid to kill you or your husband, Jean Paul, in order to save yourself, send at least $5000, today. If you don’t want to, one of you will die”. According to her colleagues, on 18 December 2016, she received three more text messages from the same number with further death threats. On 19 December 2016, she received another message declaring that this was her last chance to save her life and the life of her husband. The unidentified sender said, “...to kill a person is just a joke for me”. That same day, she received a call from the same number. She filed a complaint at the prosecutor’s office requesting that the mobile company, Airtel, investigate and identify the sender. Following this, Nelly Mbangu and her family were forced to go into hiding. I am seriously concerned for the safety of human rights defender Nelly Mbangu, and believe the death threats to be in retaliation for her legitimate and peaceful work in the defence of human rights. I recognise that the death threats against Nelly Mbangu are part of a larger pattern of harassment and threats targeting human rights defenders in the DRC which follows in the wake of the assassination of Marcel Tengeneza and Father Vincent Machozi in the province of North Kivu this year. The climate for human rights defenders is precarious following President Kabila’s refusal to leave the presidency in keeping with his two-term mandate. 3. Guarantee in all circumstances that all human rights defenders in the DRC are able to carry out their legitimate human rights activities without fear of reprisals and free of all restrictions.